Note: This idea came to me upon receiving my promotion as an Instructional Coach. A close friend gave me a (Sports Coach) whistle, along with a great card and a balloon to help me celebrate. I keep my whistle hanging in my office right next to my calendar to remind me of the similarities in coaching and teaching. (Players are prepared, suited up, and ready for the game.) The National Anthem plays in the stadium and (nearly) everyone stands. Cue the coin toss, and eventually all hands in a circle.) “1, 2, 3, Team!” and break! Whether you’re a spectator at a professional game, have a child participating in a little league game, or a staff member of a school, the theory is the same: Teamwork. Wait, but in education should it be teamwork or rather “growth”? Certainly, the school has to work as a team; there is no doubt about that. The grade level or department has to work together, as well as the Instructional Coach with the “players” (teachers). Of course, the Administration has to work with their Instructional Coach(es). If any of these pieces are missing, then “touchdowns” are being missed, and “yards” are being lost. These might even go unnoticed by the referees and fans. The fans, of course, are our students who worship us and in some part are also our referees; the referees are our Administration. Both keep us accountable for treating students equitably and enforcing procedures, rules, and consequences. Adult learning theory says that adults need to immediately see how learning will benefit them. That being said, some teachers may be complacent about being mediocre if they are not willing to trying new strategies. 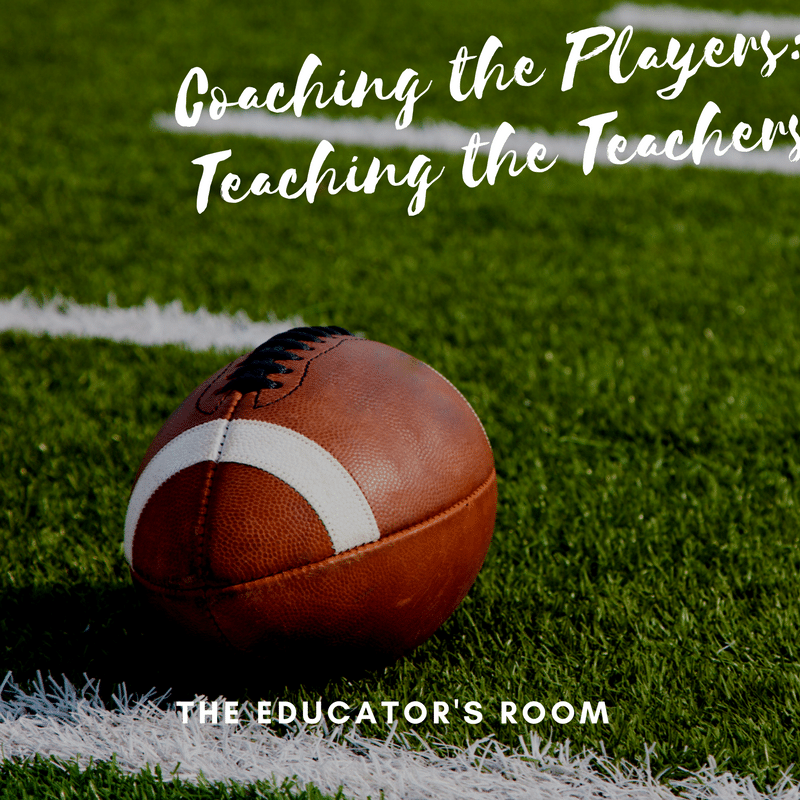 These teachers may bring to mind the football drill of “dead weight” being plowed across the field on that special machine, powered by the brute force of other players. Some teachers might be willing to try some new strategies, and some teachers are eager to try anything in their classroom. As a team, it is the responsibility of the Administration to work with Instructional Coach(es) to devise a plan of how to help teachers and differentiate the level of support each teacher needs. Ongoing conversations about progress being made by each teacher are crucial to both teacher efficacy and teacher growth. Coaches don’t encourage failure and don’t harshly punish players for making mistakes. Instead, they review the mistake with the player and then move on to the next play for improvement. This may vary depending upon how Instructional Coach positions are being utilized. However, simply put, it should not vary- an Instructional Coach is a Coach. Any district that utilizes the position as a means to “catch them” is underutilizing the role and doing a severe disservice to its teachers, administration, students, and stakeholders. However, an Instructional Coach is there to be non-evaluative. That means that a Coach is there to ask questions of their teachers; what their purpose was, what they noticed, and how will they use this in the future. This takes so much skill to be able to ask purposeful questions of teachers, and have it not be “canned”, in order to guide them into best practices. What I had at the school mentioned above was anything but a “Coach”; I’m not sure what that was! This is my first year as a Coach, and I certainly know what not to do now as I reflect back on their experiences. I had been teaching for eleven years and expected a lot out of myself. Was I perfect? No. Did I do a lot right? Yes. My growth should have based on what I (as a Teacher) saw in the classroom, and not what she thought was “wrong”. During training camp, multiple athletic trainers line the fields in case players need assistance. The NFL’s first week of Training Camp is the most dangerous; there are too many unprepared players. How can a “Training Camp” help to prepare teachers for the upcoming year? Stay tuned for next week.